If you are like me, referrals are a ripe source of new prospects. The best way to gain referrals is by building trusting relationships with your existing customers, colleagues, and coworkers. Trust is how safety is created out of fear. The fear your prospect feels is that your product or service will not live up to their expectations. When prospects feel you are trustworthy, they feel safe to buy from you. 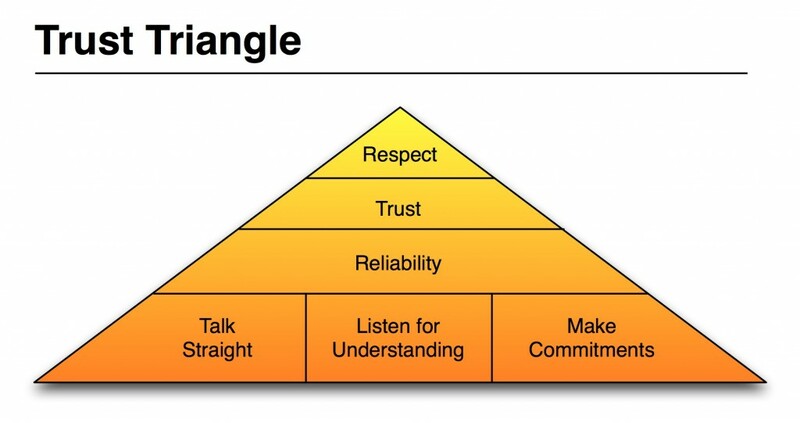 At Joey Pauley Consulting, we use three building blocks to develop trusting relationships: listening, straight talk, and making commitments. If you embody these traits, you will be more successful in your sales cycle. Observe with all your senses; don’t just listen for the words. Challenge yourself to remember observations without assigning meaning, because if your assumptions are wrong you can learn more by tracking back to your observations. When a person nods this could quite possibly be a sign of agreement. Keep listening because you may not know what they are agreeing to. In order to test your understanding, ask questions, be curious, repeat what the other person said in your own words. For instance, after presenting a meeting design, I invite people to describe the project in their own words. I ask questions in order to assure we understand one another. Then when it is time for the meeting, I trust we are on the same page. Straight talk is the balance of positive and negative feedback with respectful honesty. As a native Philadelphian making his home in Seattle I describe respectful honesty this way. On the East coast we have a tendency to sacrifice respect for honesty. Some see it as rude or even brutal. In the West we sacrifice honesty for respect. Some describe it as indifferent or passive aggressive. When giving feedback I often name the elephant in the room, the topic no one is talking about, but needs to, because it is inhibiting their progress. For instance, recently while facilitating an activity the group asked what I thought about their process. I described what I saw. Each person had individual ideas. The group brought individual ideas together in a cohesive poster. However when it was time to present their poster in front of the group, the presentation was lacking because they did not allot enough time to it. They agreed this was often how they worked. A tough, insightful conversation ensued about what to do about their haphazard presentations. Honest, respectful feedback fostered their trust in me as a facilitator. I was hired two weeks later to facilitate another team dynamics workshop. Sticking to your commitments is the most visible way to communicate trust. For new prospects make a small commitment like. “I will email you on Monday.” If you email the prospect Monday trust goes up. If you don’t trust goes down. Build to larger commitments, deals, and contracts. If a prospect asks for something by a certain time and you cannot deliver say no gracefully. Negotiate another agreement you can fulfill. Anyone can say yes. Saying no says much more about your character then yes. For instance, I was working with a designer who said he would send me samples the next day. I set up meetings based on having the samples. When the samples did not come I cancelled the meetings. The result was my colleagues and I did not trust the designer to be on time in the future. Trust can be paradoxical; in order for people to develop trust, trust must already be present. By listening to understanding, talking straight, and making commitments in your relationships you are extending trust to others. Notice how they reciprocate, because building mutual foundations of trust is the key to referrals and it starts with you. The idea for this article came to me while preparing for a trust workshop next month. It occurred to me, that acquiring new clients is 5 times harder than keeping existing ones. If you would like to learn more about building long lasting, trusting relationships or other workshops we offer, sign up for updates. Joey Pauley M.A. is a board member of the PNW Organizational Development Network. Contact him to discuss meetings, programs, and retreats that advance individual growth and encourage cooperation and trust with leadership. A.B.C. Solutions builds trust through offering performance based and objective based business development consulting services such as The Business Builder and The Business Incubator.